Keizer became an Egyptian icon thanks to his street art during the revolution. 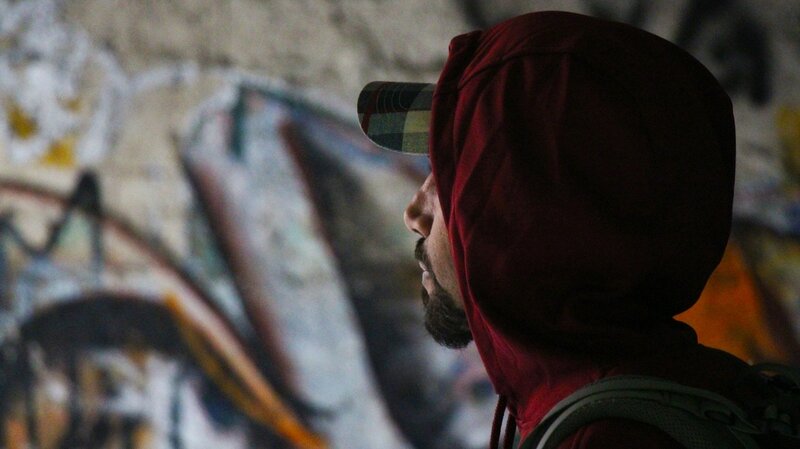 He speaks to zenith about the power of art, his experiences in Egyptian jails and why he works anonymously to this day. zenith: You are among the most important street artists in Egypt. But isn’t the significance of this art form grossly overestimated? Scarcely anything has changed because of it. Keizer: Street art is necessary, whether it is over- or underestimated. What counts is that there are people who contribute to this global form of expression every day. With the outbreak of the revolution, the street art scene in Egypt exploded. Yes, but wasn’t it the case that only a small number of young, well-educated cosmopolitan Egyptians communicated among themselves? There was a whole range of different messages. Many of them even seemed to be neither particularly critical, nor focused on social issues, which are just as important as political ones. Their attention predominantly centred on what was happening in Tahrir Square and the whole ‘The revolution will never die’ thing; the pieces were strongly politically oriented and aggressive. With time the scene slowly began to be whittled down. Only the ambitious ones kept on going. During the whole revolution it was dangerous. The fact that street art is criminalised shows how important it is – it is a tool that can provoke change by visual means. It provokes so much anxiety among governments that they are willing to fine us, lock us up, torture us. Street art could be the most important medium that there is, because it is so uncensored, unregulated, unattended. Which concrete changes did street art produce in those years? If art is sufficiently provocative, it can baffle and stir people – sometimes so much so that they even want to destroy the artwork. Why? Because emotions flare up, whether rage, disappointment, anxiety or uncertainty, that are in conflict with people’s ideologies and convictions. I think that this is how real change begins. Art changes something in people’s psyches. It doesn’t matter if they love it or hate it, it provokes real feelings. That is what we are after. We want to move people, to wake them up. But that also means you don’t believe such changes can be measured. No, it can’t be quantified. To do that we’d have to go into every household and find out if the people there had seen such and such an artwork and what kind of feelings they have toward it, as well as toward street art in general. In many countries, the general view is that street art is indeed destruction and vandalism. I think that is due to the confusion of street art with graffiti. For you, what is the difference? Graffiti is territorial and macho. It’s only about saying, ‘I am present here and now.’ Street art by contrast is much more human and aesthetic – it involves playing with words and images. It is actually art, at least more so than the mere writing of three letters representing someone’s initials. This is also why real street art is able to seriously attract the attention of the government, because it can be felt as a real threat, not just as a blemish on the neighbourhood. When you prosecute a street artist, you are prosecuting his thoughts, his ideas and his messages. How do you see Egypt at present? Egypt is stuck in the mud. It is a military police state, every voice of dissent against the military or the government is stifled. That’s why everyone is in a state of total passivity at present; they only want everything to flow, irrespective of where the flow carries them. Next to the ritual glorification of Sisi as saviour, the government created an enemy: the invisible, omnipresent Muslim Brotherhood. Everyone is afraid of finding one of their members under the bed or just around the corner, and many ominous things have happened, like bomb scares or bombs that have missed their target. People are beginning to ask whether the government is embroiled in these affairs. At present things look dismal, it is a seriously bad situation. How do present developments affect you as an artist? When Sisi and the military took power, I fell into a state of depression. All my hopes and optimistic visions of the future were crushed. I lost the inspiration to make art as I had done. Unlike many others, I worked ceaselessly. When Sisi took power, it was a kick in the teeth – and a warning signal. It changed my work: now it is more universally oriented, for example I use more English because I want to reach a wider audience. Because although I produce Egyptian art for Egyptians in Egypt, my art has always had universal traits, themes that are open to interpretation and that touch on everything that affects us as human beings. Does that mean you have given up on the idea of changing anything in Egypt? I have given up on that idea, but I will not stop creating art in the name of change, or at least in the name of calling into question the realities and authorities in Egypt. What do you mostly concern yourself with in your work? Things like injustice, repression, capitalism, materialism, love versus fear, the concept of war, the unnecessary squandering of life – and the social problems that we are all living through as a collective humanity. Things that we have tolerated for centuries, such as handing our freedom over to governments. Everything that for a long time was considered self-evident, and what is now gradually beginning to dawn on us. What is your favourite stencil? I’m proud of each and every one of them. But I do have a secret liking for the motifs that don’t attract much attention. Do you remember the most moving response to one of your stencils? He saw the finished stencil and said, “Allah yanawir – God enlightens.” Instantly his feelings completely changed, from shouting out loud to “Wow, that’s cool! Why didn’t you say that in the first place? That looks really great! What’s this all about?” and he started getting interested in street art. That was my first experience of this kind. At that point I understood the power of art in general. I could move people emotionally and take them out of their comfort zone for a few moments. Would you say that success has changed your art? The whole idea behind working anonymously is the concern that money, renown or fame changes you. I try to keep my ego at a healthy level, and to remain humble in front of the works and amazing creativity of other people, whether old masters or new artists emerging in the scene. Does your life as a full-time artist leave you any room for a job, a partner or any other elements of a ‘normal’ life? Street art has become my job. I always wanted it to be. I always wanted to be a trailblazer and a source of inspiration for younger Egyptians who want to be street artists. What more could you ask for, than to be able to do what you love, to have fun doing it, to not be told what to do, and to be paid for it? In order to make art approachable for people, it seemed self-evident that I would have to transfer my street art to the canvas. But I don’t produce works according to customers’ wishes – only what has already been sprayed in the street can be sold. Apart from that, I no longer take chances now that I’m with someone I love. Earlier I was on my own and could risk my life for things. Apropos of this, many street artists in Egypt work in groups, but you work alone – why? Collaborations are very healthy, but I’ve taken another path. What Egypt needs is more individuality, rather than more people hiding behind the revolution and cliques which tend to overshadow the potential and talent of many individual artists. It seems unfair when many people work together as a unit and receive recognition as a team, although some have worked harder than the others. It is time for the people with talent to come forward and say: “This is my art, and I stand by it.” Everyone should present themselves and their own ideas. How do you handle criticism from other street artists? I don’t pay it much heed, because I was never really part of the scene. It was always like, “Keizer does his own thing.” Rumours about me started to circulate as a result, that I was arrogant and conceited because I wouldn’t cooperate or didn’t want to be a part of the scene. And I had so much pent up inside of me, I had so much to say, that I didn’t feel like I could take the time to talk about it with anyone else beforehand. It seemed as though the ideas had already crystallised and were only waiting for the right moment to be outwardly expressed. And this moment was the 2011 revolution. Would you still have become a street artist if it hadn’t taken place? I had actually already had the idea of becoming a street artist a month before the revolution. I remember clearly how I was thinking about a name, but not yet about things like spray cans or technique. Then when it happened, everything I’d been thinking about came together and took form very quickly. It was as if I already had a draft for everything. How do you think Egyptians receive the stencils you design in Arabic? They are very site-specific and specially produced for Egyptians. My style is not elitist, but rather down to earth, on the level of the lower social classes, because they are the ones I want to address. In my stencils I speak the language of the streets. They might be hard for foreigners to understand as a result. They contain Egyptian metaphors – traditional proverbs or urban myths, quotes from Egyptian folklore or a punchline from a comedy or a piece of theatre from the ‘70s. Things that only Egyptians know and can decipher. What role do such messages play in your piece depicting a monkey in a spacesuit? That’s what is beautiful about street art. Suddenly something completely incoherent like that comes to me, and I’m fully aware that it won’t draw much attention. But that doesn’t mean I only make it for myself. Many things have to be a little more perplexing. Not everything can always be straightforward and immediately understandable. Sometimes you just need a little more imagination. It is a matter of imagination, or rather of education? It’s about imagination. I receive innumerable intelligent commentaries from simple, poor, working-class people. The way in which they decode the messages is extremely philosophical, detailed and profound. That made a real impact on me and encouraged me to never underestimate my audience. Simple people decipher the messages more accurately than many educated people, because they are less influenced by social constructions and institutional paradigms. Less-educated people take your messages more with open hearts and at the level of feeling, while the others understand them more rationally? You’ve worked anonymously from the very beginning. Why? For the sake of my own security and inner peace. At the beginning of the revolution everyone was happy to be able to discuss their art in the global media spotlight. But to me it was always clear that one day the government would clamp down on artists, and I wanted to be prepared for that moment. If in the beginning I still had doubts about whether I wanted to remain anonymous, they were swiftly dispelled by the seizure of power first by the military and then by the Muslim Brotherhood. A second reason is that I believe my face has nothing to do with art. My art speaks for itself. I want people to concentrate on my message. Have you heard of any cases of other street artists whose security was threatened because they weren’t anonymous? Yes. Ganzeer, for example, received a death threat. His face is depicted in a number of graffiti books and elsewhere. I don’t think he lives in Egypt any longer. What was the most dangerous situation you’ve found yourself in in the last four years? Once I was busted on the street by four police officers in a patrol car. This had happened to me before. But this time they were fast and aggressive, so I had no time to talk or negotiate. I was grabbed, hit and kicked, and then hauled into the car, where they kicked me a few more times. We drove around the neighbourhood for a good while, while they did their patrol, which partly serves to intimidate you and to give you the feeling that this drive will never end. Then they take you to the police station, where they take your statement and personal details and then throw you into a room with 50 other accused people and who knows who else. It’s completely dark and really stifling. The chances of being either stabbed to death or robbed are extremely high. People say you have to big-note yourself in such situations, but actually you have to feel your way through it and trust your instincts. I quickly made friends with someone. This person became my protector, because I’d promised to get him cigarettes. But then he simply disappeared and someone else came up to me and attacked me. A scuffle broke out. Some people had weapons and drew them. I disappeared under the cover of darkness while I was being shoved around and no longer knew where my attacker was. Then you sit somewhere in the dark and you don’t know where you are. It was a long night. Afterward the police came in and beat us badly, twice. Finally, some of us were called out and our cases were heard. This experience didn’t stop you making street art? Ultimately the police are just doing their job, as they have for centuries. It’s neither new nor surprising. On the other hand, they only spurred me on. Rage and frustration were always fuel for my art. In that sense: thanks! That’s all I can say. What are your plans for the future? Do you want to spend the rest of your life in Egypt? Egypt is my homeland and always will be. It’s a place that I associate with warmth, not just because of the climate, but the people too. I’d like to continue to make art in Egypt, because I believe that there is a demand for it in this country. People have been deprived of art and culture for a long time. I can’t simply close my eyes to that fact. On the other hand, I have the feeling at the moment that the whole world is my home. I’m travelling, but I will always return to Egypt.